Handing off Harbour Seal pup “Fathom” to intern Jill Binder, is rescue pilot Norm Snihur. Fathom initially caught the eye of Hornby Island resident Barb Biagi who alerted Island Wildlife of a potential pup in trouble. It wasn’t until several days later that the orphaned pup was weak enough to be rescued. Legend has it that 2 wonderful rescuers took to the water, swimming to the rocky outcropping where Fathom lay, in order to bring him back to Hornby Island and a location where Norm could land his helicopter. A really nice effort on everyone's part has saved another of our island critters from a very bad end. I love the story and the pictures from this Legend! Thanks so much Wren and Norm. 12 years ago today, pilot Norm Snihur rescued “Mr. Potato Head”. Since then, we have had a love affair with Norm. No matter what the animal, if Norm’s copter wasn’t “in the shop” he was flying for us and myriad other wildlife centres throug...hout BC. Norm to the rescue sounds silly, but that is the reality of Norm’s contribution. At the most vulnerable time in an animals life, when they are facing life and death, it is indeed, Norm to the rescue. Norm, you are a true prince among men. Story of my attempt at capture of the Phipp*s Point Seal pup, & a foto here. On august 20, i got a call from Marielle asking for my help in rescuing a starving Seal Pup that was spotted in Helliwell Park at low tide. By the time i could drive, then walk out there, the pup was nowhere to be found. i went out two more times looking for him, & wren went one evening in her kayak to search all the shores, but this poor little one was never reported again. On saturday october 19, Marielle asked me to assist with a pup that had been found at Tribune Bay. They needed a larger kennel, as their tub had no lid & the pup was feisty enough to try to escape. Well, it turned out that the pup was actually in Helliwell Provincial Park. i drove there with the big Eagle kennel that madrona donated to us, expecting to transfer the pup into the big kennel from the lidless tub, in the parking lot. But i was met by a young fella who walked me out, sharing the load of the kennel, to where the rest of the family was waiting, with the Seal pup held under a tub. They were down on the beach, at almost the furthest point of the Helliwell walk. They had spotted the pup, watched a bit, then walked on. 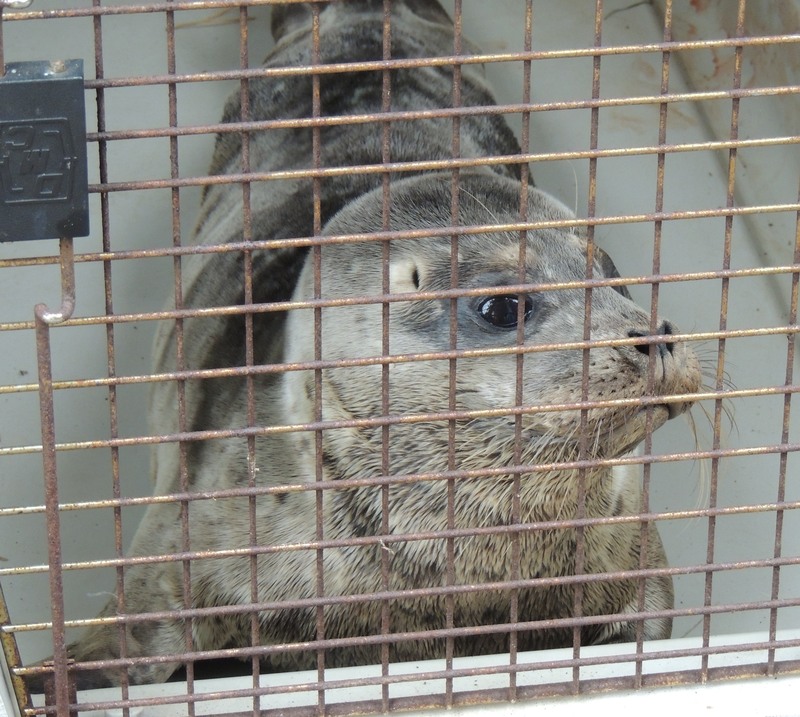 When the pup was still there 20 minutes later, they called the VanAqua Marine Mammal Rescue coordinator who referred the call to the Saltspring care center. It was suggested that they nab the pup & put him in a tub, which they did, but the pup was feisty & kept trying to escape. So that was why i was called in, to bring a bigger kennel. The pup was on a pebbly beach which you had to get to by climbing down a bit of a rock face. The family used driftwood to make a barrier to get the pup to go into the kennel rather than escaping to the water, which he was trying to do. He finally climbed into the kennel. Then the family clambered the heavy kennel up the rock face to the Park path, & we took turns carrying the kennel to the parking lot. The family loaded the kennel into their van & followed me to Ford Cove where Marielle had set up Jim Funk*s Water Taxi service to deliver the pup to another pick up person on Vancouver Island. They met successfully, & i even got my kennel back the same night. 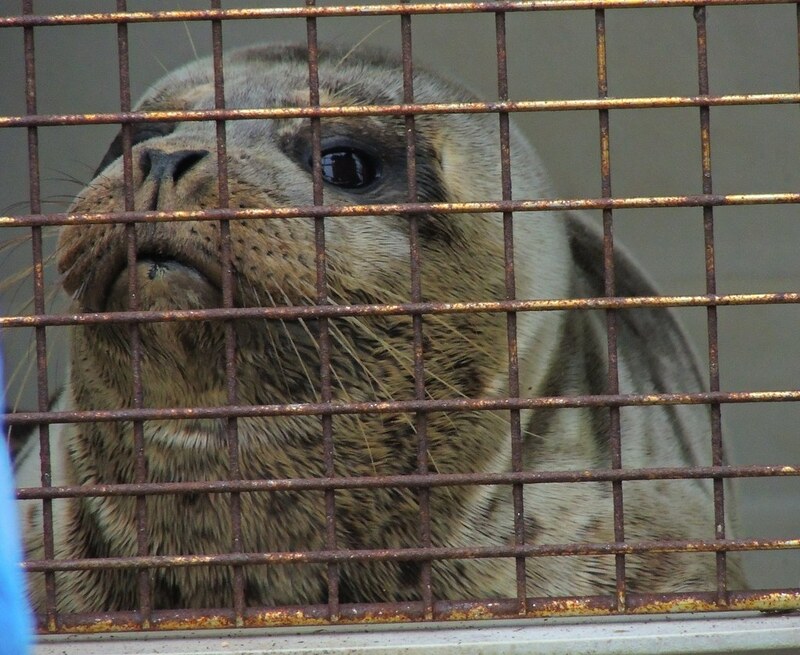 i had to sterilize it, as there was blood, & also Seals can carry diseases communicable to humans. The pup*s tail had open bleeding wounds, not sure what caused those. 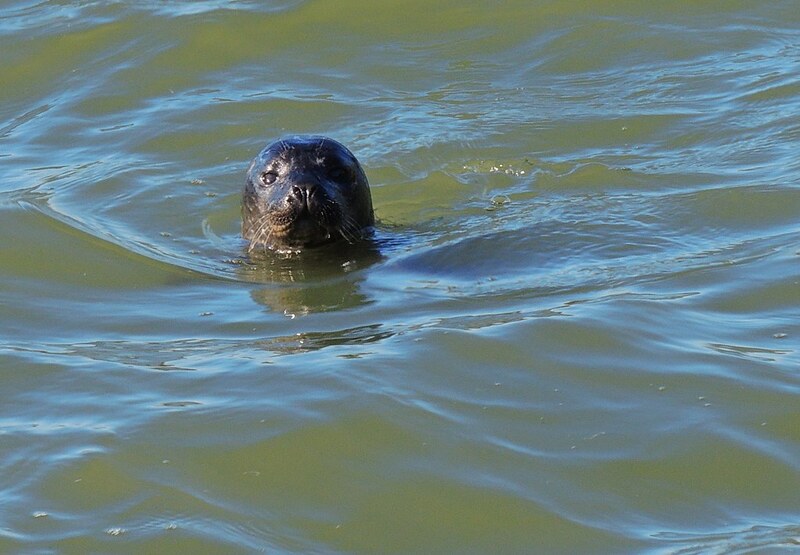 Here is a link to a foto of the young one, plus the report from Saltspring Island! i will post some fotos from this rescue soon. Nice photo of the little fella on the FB link. Thanks Booni for your part. I do hope they keep us updated. Here are a couple of fotos of the *weaner* Seal in the Eagle kennel. Click here to go to the Salt Spring Natural Care Centre*s Facebook page to see more fotos taken by the family who found her! Late this afternoon i got a call from Marielle asking for help. She had two kayakers on Denman who had found a Seal that was lying on the beach not trying to get away from them, so she asked them to capture. They did so, & put the Seal in the bow hatch of their kayak with the lid on! i was asked to bring our big carrier down to Ford Cove to meet Jim Funk again in his Water Taxi. We would take the carrier to Denman & transfer the Seal from the kayak to the big carrier. So we loaded up the boat & off we went to Gravelley Bay on the Hornby side of Denman, right next to where the ferry docks. The two kayakers were waiting for us. & sure enough they had the seal in the hatch of their kayak. They carried the kayak & the carrier high up the beach so the Seal couldn*t escape into the water. We were told that he would try to bite us so be careful! The kayakers adeptly put the mouth of the kayak hatch against the mouth of the kennel & in the Seal went. Next they transferred the kennel back to the boat. Off we went to Deep Bay! The water at the Denman ferry was beautiful milky blue, so cloudy you couldn*t see in the water at all. There was foam floating everywhere & the smell was divine. There were a good half dozen Herring fishing boats, some actively beating their nets full of Herring into their skiffs. Sea Lions were floating through the beautifully-coloured water in groups. Gulls were flying everywhere & Eagles were in abundance. Soon we left this behind as we went around the Chrome Island Lighthouse & off to Deep Bay. i*ve never been there before but Jim knew the way which is a good thing as it is a bit tricky with shallows. We were met by the volunteer who also met Jim to pick up the last Helliwell weaner Seal Pup. She had a smaller carrier & she transferred the Seal from our big one into her smaller one. Then off she went to meet someone in Nanaimo who would drive the Seal to the next pickup & eventually to Saltspring Care Center. Let*s keep an eye on their Facebook page, as i bet we*ll see updates about this Seal there, i hope! Thanks once again booni, for all you do. Thank you booni and for all those who assist in ths wonderful relay rescue It does take a village. What a wonderful day for you to witness eye to eye the wildlife at waters level. It all sounds surreal and beautiful. Thanks Booni again for a great job and all that helped. Let's hope things go well for the pup.